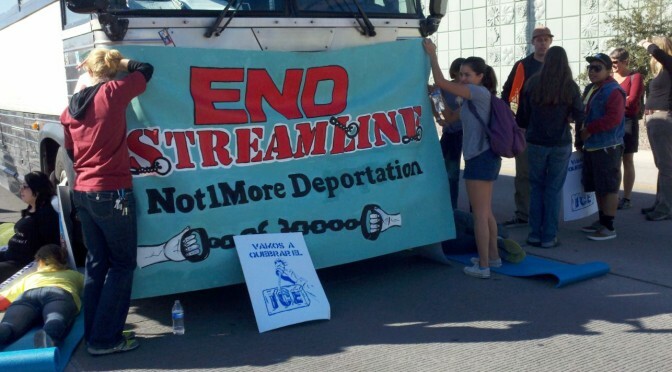 TUCSON, AZ—A trial will begin for 13 activists on Monday, 16 March 2015, for charges stemming from a direct action that took place on 11 October 2013 blocking two buses transporting undocumented immigrants to the daily proceedings of “Operation Streamline.” The buses were stopped on the I-10 frontage road before reaching the US District Court of Arizona in downtown Tucson. The number of misdemeanor charges varies by defendant, but include the following: (1) obstructing governmental operations, (2) hindering prosecution in the second degree, (3) disorderly conduct, (4) obstructing a highway or other public thoroughfare, (5) public nuisance, (6) criminal trespass in the third degree, and (7) resisting arrest. Each day the Tucson Sector Operation Streamline proceeding, ongoing since 2008, collectively processes about 70 migrant men and women, who are shackled at their ankles, waist and wrists. Referred to as “assembly-line justice,” the migrants are pressured to take a plea deal by private attorneys, waiving their rights to appeal, and then given criminal charges and prison sentences prior to their deportation. Most, if not all of these migrants, are sent to private prisons for up to 180 days. 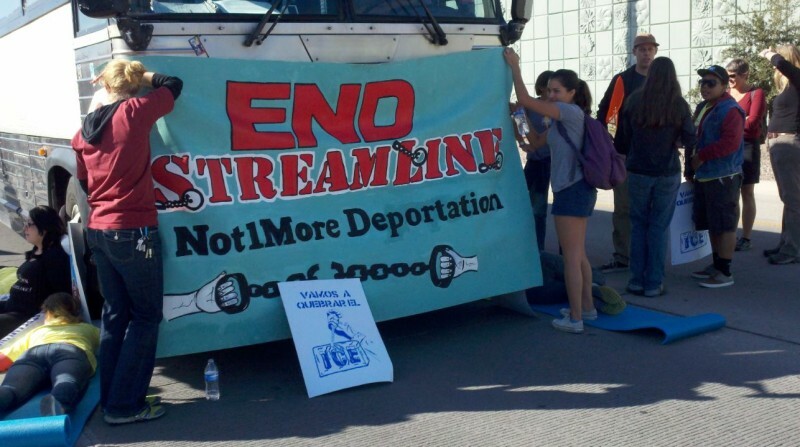 Streamline raises serious and troubling questions about constitutionally protected due process, the growth of private prisons, the deepening criminalization of migrants and the exploding costs of contemporary immigration enforcement, all with human costs that devastate families and communities. Start time each day: 9:00 a.m. Please be in touch with the media contact to arrange interviews with the defendants.